6th Edition of KIA Go-Xtra Campaign Awards Winners! Naza KIA Malaysia, the official distributor of KIA vehicles in Malaysia, has awarded the winners of their annual Kia customer loyalty program, the Kia Go-Xtra 6th Edition 2017. One grand prize, one second prize and five consolation prizes were awarded to the winners of the Kia Go-Xtra 6th Edition 2017 campaign at a special prize-giving ceremony at Red Cube, Rawang, Selangor. “The Kia Go-Xtra campaign was first conceived in 2012 to reward our loyal customers for their fervent support towards the Kia brand all these years. The campaign gives us the opportunity to reward a few lucky winners to explore the rich culture of Korea through the heart of its capital city, Seoul. These winners will also have a chance to tour Kia’s impressive manufacturing plant and world-class R&D centre. Meticulous research and engineering are implemented and perfected in these facilities to produce among the world’s best vehicles in terms of design, performance and safety which is what the winners will have the privilege to witness first-hand” said Norazmi Md Taib, Head of After Sales Division, Naza Kia Malaysia Sdn Bhd. 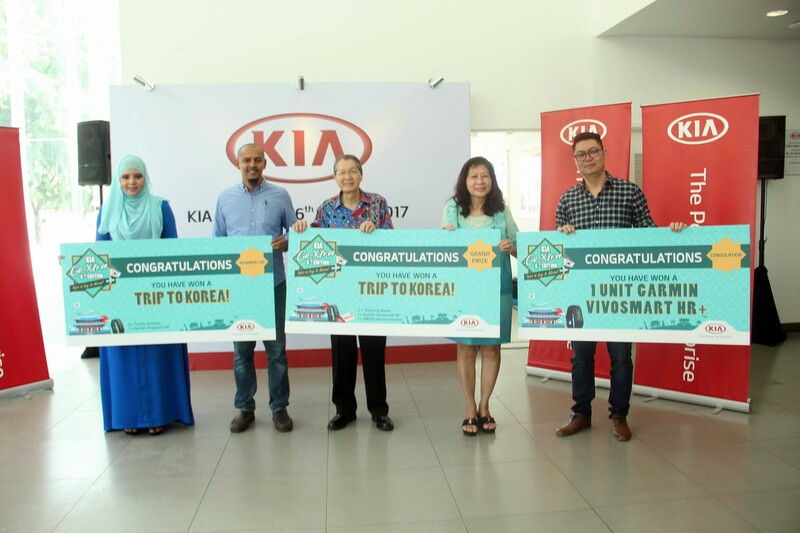 The grand prize for the Kia Go-Xtra 2017 campaign went to Darren Yam Kok Wing from Petaling Jaya, who won himself an all-expenses paid five days four nights trip to Seoul, Korea for two persons, a Garmin Vivosmart HR smartwatch and RM500 Kia service vouchers – altogether worth over RM8,000. Meanwhile, the second prize went to Nazaruddin Kassim, from Johor Bahru, who also won himself an all-expenses paid five days four nights trip to Seoul for two persons and a Garmin Vivosmart HR Smartwatch. Five other consolation prizes consisting of a unit of Garmin Vivosmart HR+ smartwatch worth RM848 were given out. These consolation prizes were awarded to Lee Kian Aik, Mohd Zahari Bin Rupiat, Oon Chooi Huat, Simon Siew and Wong Loo Xuan. To participate in the Kia Go-Xtra 2017 campaign, customers who serviced their Kia vehicles at authorised service centres over the period from 1st June to 31st July 2017 were eligible to submit an entry and vie for the grand prize. During the campaign period, customers enjoyed a 30% discount for Brake Pads and Selected service items and another 10% discount on air conditioner service, valid for all Kia models. 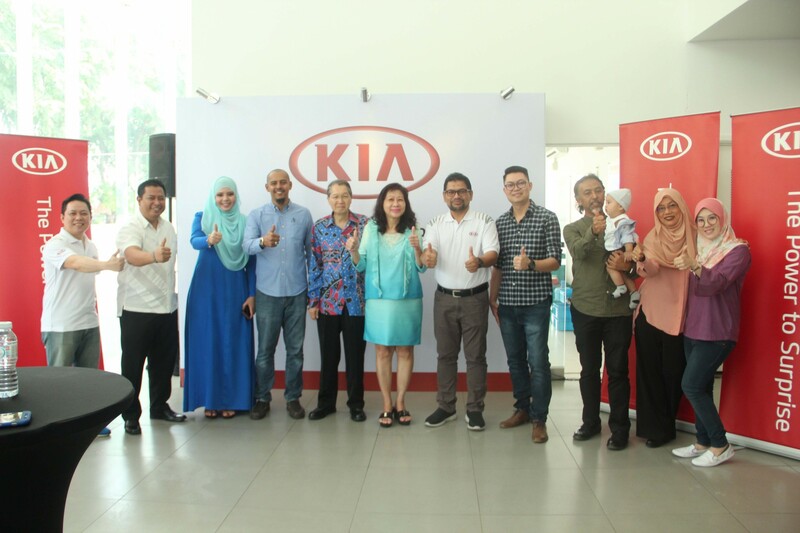 This is the sixth consecutive year Naza Kia Malaysia has held the Kia Go-Xtra campaign to reward their existing customers for their continuous support. In previous years of the campaign, the grand prize winners were also given the lifetime experience to visit Seoul, Korea on all-expense paid trips. Heels & Wheels: Volvo Trucks’ Fuelwatch Challenge 2017 Creates History With First Female Truck Driver To Compete In Malaysian Finals! KIA – The Design Transformation of the Decade!